Figure Skaters Online is pleased to welcome Nathan Chen with the launch of his new official website at http://www.figureskatersonline.com/nathanchen/. 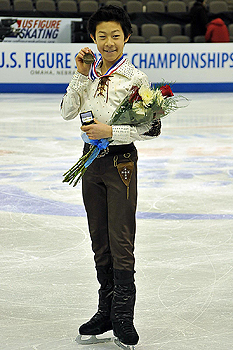 The 14-year-old Chen is a three-time U.S. national champion at the novice (2010 & 2011) and junior (2012) levels. In addition, he has won national medals at the juvenile (bronze, 2008), intermediate (silver, 2009), and junior (bronze, 2013) levels. “I am very happy to join Figure Skaters Online and really appreciate my new official website,” he enthusiastically declared after the launch of his new site earlier this week. Chen, 14, trains at the East West Ice Palace in Artesia, Calif., and represents Salt Lake Figure Skating. He is coached by Rafael Arutunian, Nadia Kanaeva, and Vera Arutunian. Kanaeva choreographed his competitive programs this season. Chen began his international season in September by winning consecutive gold medals at ISU Junior Grand Prix (JGP) events in Mexico City, Mexico, and in Minsk, Belarus. He has qualified for his first ISU Junior Grand Prix Final, which will be held in Fukuoka, Japan, December 5-8, 2013. Competing at the JGP Final will give him a bye to the 2014 U.S. Figure Skating Championships in Boston, Mass., where he will attempt to win, January 7-9, his second junior title in three years. NEXT Next post: Jason Brown: Ready for the challenge!